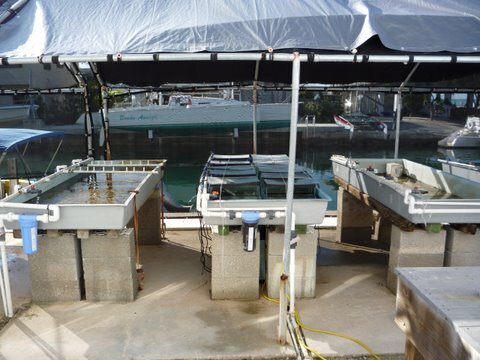 A major advantage of land-based nurseries is the practitioner’s ability to manipulate environmental conditions and promote optimal coral survivorship and growth that occurs all year round. With a high quality system, conditions can remain stable through seasonal changes, storms, and bleaching or pollution events. In addition to being protected from environmental extremes, corals in land-based nurseries can be sheltered from biological pests such as predators, damselfish, algal overgrowth, and disease if proper quarantine and maintenance practices are used. Land-based systems also allow corals to be propagated from small amounts of donor material and from larvae derived from collected coral gametes. Land-based systems can therefore be very beneficial for endangered corals or populations that are low in abundance within a site or region. 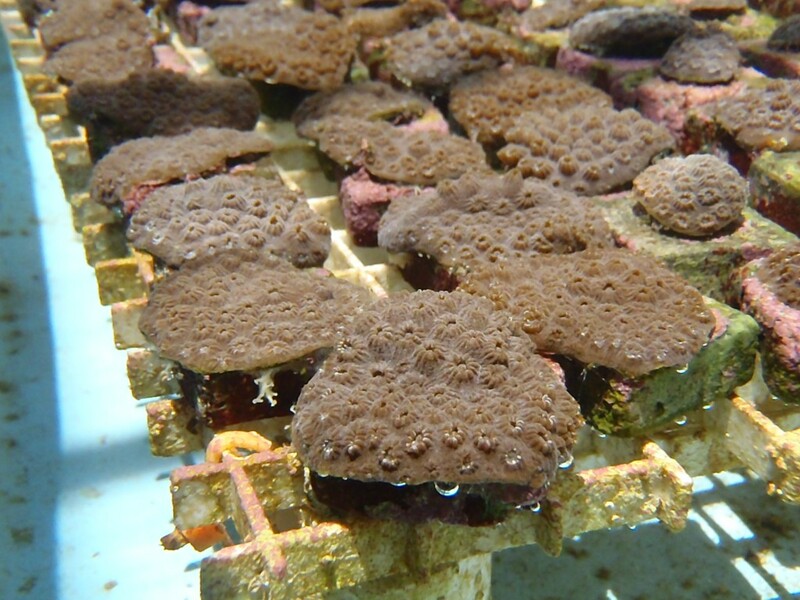 For instance, a technique called “micro-fragging” has been employed in some land-based nurseries, where coral colonies are reared from from fragments the size of just one polyp. ref Finally, land-based systems can be used for experimentation, gene banking, land-based sexual reproduction, rescuing genotypes, or temporarily holding facilities. The most common concern for land-based aquaria are high costs, and failures or malfunctions that can result in major losses to coral stocks. Thus, land-based nurseries require more experienced staff that are trained in water chemistry and aquarium husbandry. Practitioners of land-based systems should ensure that no diseases or non-native species are transferred between aquaria and natural reefs. For this reason, any corals which are intended to be out-planted, must be kept in accordance with permitting guidelines. Additionally, a health assessment must be performed by an approved veterinarian before corals may be out-planted. When determining the location of a land-based nursery, the main considerations are that the nursery be geographically “near” outplanting sites and have access to a reliable source of high quality sea water. This source may be directly from the ocean, from a salt water well, or be mixed on site. As is always the case, there are trade offs associated with each water source and type. These include start-up and operating costs, quality and treatment requirements, and the ability to alter the water as needed. If flow-through ocean water or well water is used, it may still be necessary to treat the water prior to use. This treatment may include degassing, temperature control, ammonia removal, calcium additions, or other adjustments of water parameters. If a recirculating system is used, essential components include a biological filter, protein skimmer, source of calcium and alkalinity (like a calcium reactor), temperature control, a dechlorinated and purified water source, and a reliable backup power system. Water system distribution is important for the success of land-based systems, and include components such as pumps, piping valves, and tanks. The size and shape of tanks, materials used, as well as overall design and drainage systems are also critical. All land-based facilities should take care to control light and temperature through shading screens (if outside). General water quality conditions should be stable and maintained at optimum levels for coral growth. Factors such as light intensity (PAR), fine temperature control, inorganic nutrients, dissolved organic carbons, aragonite saturation state, food availability, and water flow are important factors for optimizing coral health and growth. As a rule of thumb, it is suggested that if any water quality parameters are out of range for several days, parameters should be brought back one at a time and brought slowly back into range. ref Water quality testing should occur daily if possible, with a minimum testing schedule of once per week. Automated systems that continuously monitor water quality can be useful but also expensive. Water flow rates should be alternating and turbulent if possible. Lower water velocity may keep corals alive but reduce growth, branching, and skeletal density. The tank should circulate its volume at least 10 times per hour. ref Light levels should be similar to the natural habitat where corals originate or their depth. Other light levels may be acceptable, but may reduce coral growth and lead to problems controlling algal growth in tanks. Herbivores such as snails should be considered as a way to reduce algae in tanks in addition to manual removal methods. In general, herbivores, live rock, and any other biological components of the aquaria system should originate from the same area as the corals being propagated. 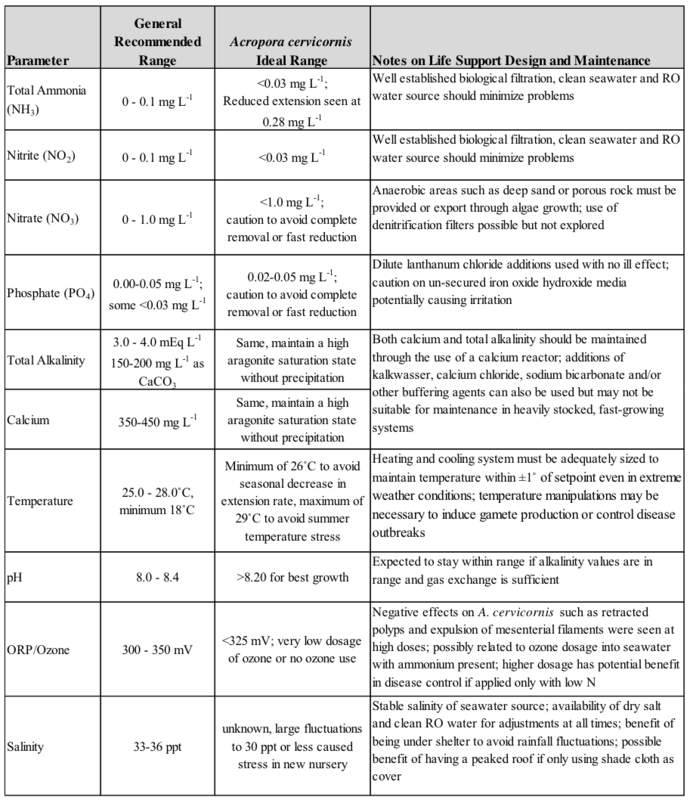 The table below shows water quality parameters commonly measured in coral aquaculture and recommended ranges for A. cervicornis (from O’Neil 2015). Before placing corals into land-based aquaria, corals sourced from natural reefs should be quarantined for a minimum of one month by placing them in tanks with separate water circulation systems to prevent mixing of water. After this quarantine period, corals that are visibly healthy (i.e., not showing signs of disease, tissue loss, discoloration, paling/bleaching, or any parasites) may be mixed with other corals. Corals with any abnormal conditions should remain in quarantine until conditions are absent for a minimum of one month. Prior to placing corals in holding tanks, tanks, filters, and all equipment associated with husbandry and propagation should be drained and cleaned. Corals originating from different locations (states, countries) should be kept in tanks with separate water circulation systems to prevent potentially introducing species from different geographical locations. If keeping corals in separate tanks or in separate water circulations systems, such as when quarantining new corals or rearing corals from different geographic locations, practitioners must take great care when handling corals or using aquaria equipment. Equipment such as brushes, buckets, filters, pumps, or anything else in tanks should be soaked or thoroughly rinsed in freshwater and dried before being transferred between tanks. Skin exposed to water in aquaria should be washed in warm soapy warm to prevent any possible transfer of organisms like microbes between tanks. It is recommended that corals showing signs of disease be treated by removing or covering up portions of the colony that appear diseased or infected with epoxy. Treatment with medicines is also an option. Removed portions of diseased tissue should either be destroyed or preserved for research. Colonies should then be quarantined in aquaria with separate water circulation systems until they have been free of disease symptoms for a period of one month. For colonies where most of the living tissue appears diseased, the entire colony should either be destroyed or preserved for research. Extra precaution should also be taken when working with corals that show any signs of disease or other abnormal conditions. Hands should again be thoroughly washed in warm soapy water before touching other coral colonies. Gloves can also be worn when working with diseased or unhealthy corals and removed before coming into contact with other corals. Any equipment used in tanks with corals showing signs of disease or other conditions should be rinsed in 5% bleach solution and then freshwater before being used in other aquaria.